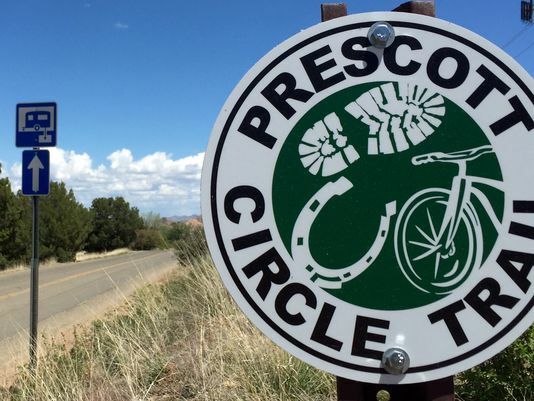 Have you heard of the Prescott Circle Trail? Take a look at the video below! Although not fully connected yet, the Circle is rapidly closing and will include trails from the City of Prescott, Prescott National Forest and Yavapai County for a 50-mile loop around the City. It will be a multi-use trail with some camping locations along the way. The trail is actually a composite of individual non-motorized routes that lie on lands managed by the City of Prescott, Prescott National Forest, and Arizona State Land Department. The Prescott Circle Trail (PCT) is designated non-motorized for its entire length, meaning it is intended for hikers, equestrians, and mountain bikers only. It is a beautiful trail that meanders through forest, chaparral, grasslands, and along the shorelines of Watson Lake, Willow Lake, and Goldwater Lake. The topography along the route ranges in elevation from about 5,200 feet to over 6,000 feet. The route features a number of sites for trailhead parking as well as sites within the interior of routes that will be suitable for overnight camping. The Guide provides detailed descriptions and annotated maps of the various segments of the trail. It is currently available for sale in Prescott at The Hike Shack, Manzanita Outdoors, Jay’s Bird Barn, Granite Mountain Outfitters, Peregrine Book Store, and Prescott Chamber of Commerce.